DNA stores the genetic information in each living cell, so its integrity and stability is essential to life. But it's constantly being damaged by environmental factors like exposure to ionizing radiation, ultraviolet light and toxins. And DNA replication is also prone to error during normal cell division, so your body is busy constantly repairing damaged DNA. 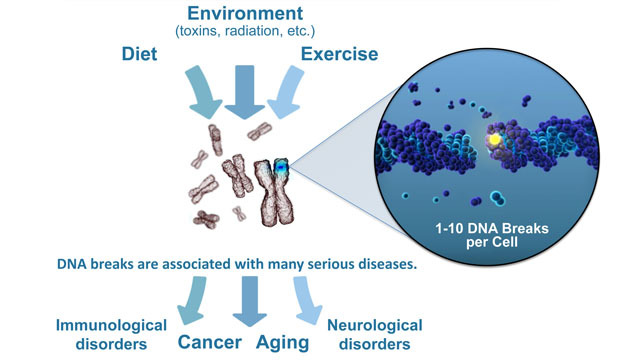 However, sometimes this normal DNA repair process fails, causing damage and genetic mutations to accumulate which leads to serious health problems like cancer, immunological disorders and neurological disorders. If your annual checkup included a simple blood test to determine how much DNA damage you have in your body, you may be able to optimize your long-term health by taking action to minimize DNA damage due to your diet, exercise and environment. A startup company called Exogen Biotechnology wants to provide the public with a way to monitor their DNA health, so they can act to reduce damage. Exogen has developed technology that can rapidly quantify a type of DNA damage called double-strand breaks. Exogen is moving this technique out of the laboratory to make it publicly available. They have significantly improved the technology so that it’s feasible to rapidly test small blood samples for the level of DNA double-strand breaks. 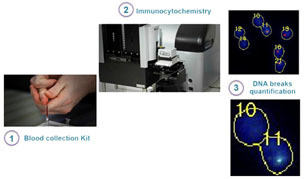 A customer collects tiny blood samples using an in-home kit, combines the blood samples with a fixative solution to preserve them, logs on to the Exogen website to register the samples and complete a questionnaire, then mails them to Exogen for analysis. Exogen tested their new technology in two pilot studies with a total of 97 people. They observed a significant increase in the level of DNA damage with age, where 70-year-olds had double the number of DNA double-strand breaks compared to 20-year-olds. The four people who had suffered from cancer also had a higher level of DNA damage compared to others in their age group. Update: This article was modified to disclose Sylvain Costes' affiliation with Lawrence Berkeley National Laboratory.